Sap flows through maple trees which can be made into various maple products. The most common trees to tap for maple sap are mature silver, red, black, and sugar maples. Trees are tapped by drilling a hole and inserting a spile, or tap, into the hole. A bucket is hung from the hook to collect the clear drops of sap. The sap is collected during the late winter or early spring and boiled to create delicious maple products. Forty gallons of sap are required to make just one gallon of maple syrup. As it boils, it becomes thicker and thicker. By cooking maple syrup longer, the syrup thickens to make other products, such as maple candy. Once the maple candy reaches the appropriate temperature, it is placed in candy molds. Though I made maple snow candy, I leave traditional maple candy making to our friends who have a maple farm. The candy above came from the Dewy Meadows Maple Farm. If you don't live near a maple farm, I'd suggest trying their maple products. It's a family farm with a big heart. To learn more about the making of maple syrup or buy products to tap your own trees, check out Tap My Trees. 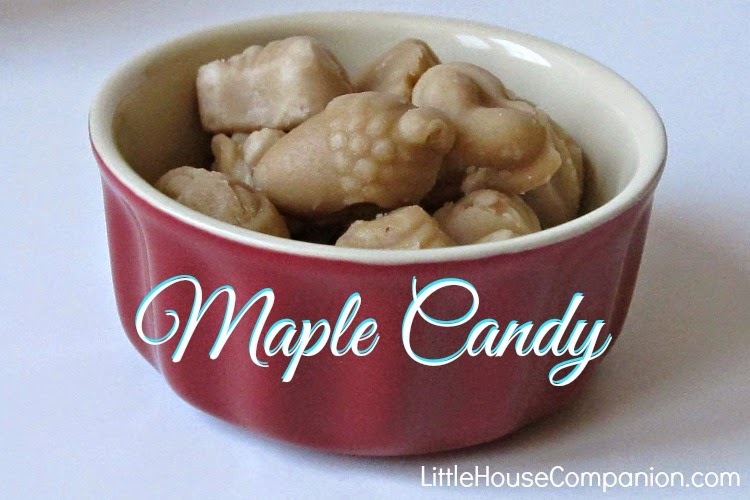 Have you ever had maple candy? Do you buy real maple syrup?